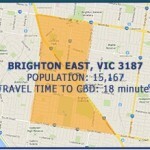 Another suburb of Melbourne is Brighton East situated 11 kilometers south-east of the Central Business District. A part of the City of Bayside, it has a population of 15,167 as of 2006. Below is our infographic providing further information from demographics, housing and auction clearance rates on the suburb.